Welcome to the PUTTC home page. Please visit the "About Us" section to find all information about the Club, including practice times, policies, opportunities for students, etc. All club practices take place on court 4 on the main floor of Dillon Gym (the court farthest from the entrance). Bring your PU ID for access to the gym. Players of all levels are welcome! In addition, the former squash court no. 16 is available for individual play whenever Dillon Gym is open; the key can be checked out at the front desk (2 PUID needed; balls and basic paddles provided). Also, Princeton Pong is a new dedicated table tennis facility located 2.5 miles south of campus. See www.princetonpong.com for details, rates, and special events and programs. After a one-year hiatus, PUTTC managed once again to qualify for Nationals and competed in the 2017 TMS College Table Tennis Championships (April 7-9 in Eau Claire, WI). Representing Princeton were Sam Bernstein '19, Nicholas Chow '18, Justin Do '17, Shirley Fu '17, Danny Gitelman GS, Zach Weingarten '18, and Erica Wu '18. The coed team (seeded tenth) beat Ohio State and U of Wisconsin-Eau Claire to qualify for the round of 16, where it lost a close contest to seventh-seeded U of Texas-Austin. In women's doubles, Shirley Fu and Erica Wu finished in second place, after upsetting the second seeds Lily Zhang and Prachi Jha (Cal-Berkeley) in the semifinals. Full results can be seen here. Video of many matches (including several with Princeton players) is archived on YouTube - ITTF Channel. 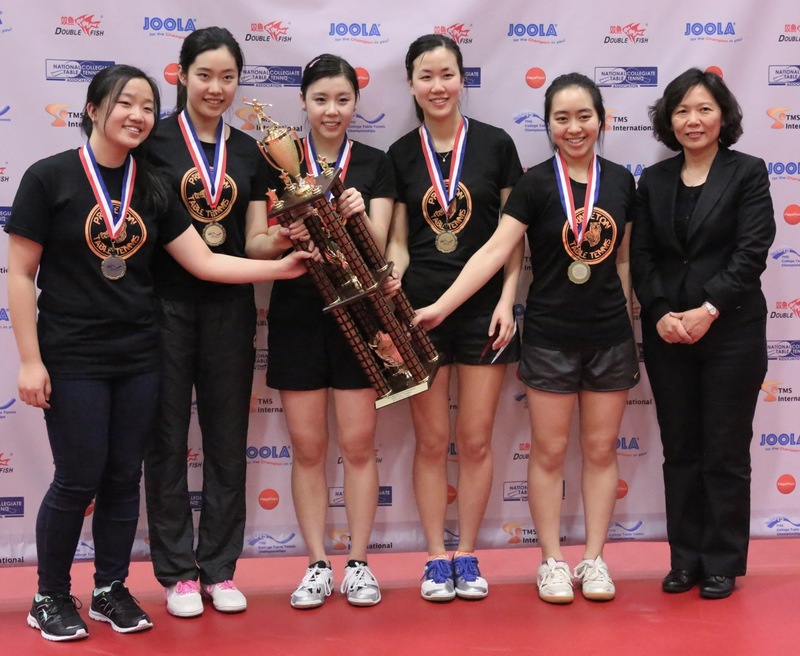 At the 2015 TMS College Table Tennis Championships (April 10-12 in Eau Claire, WI), PUTTC won the titles in the women's team and women's doubles events! In women's singles, Ariel reached the final, and Shirley and Erica the semifinals. The coed team finished in 7th place. Competing for Princeton were Marisa Chow '17, Justin Do '17, Shirley Fu '17, Ariel Hsing '17, Robin Li '17, Avinash Nayak '18, Zach Weingarten '18, and Erica Wu '18. At the NCTTA Northeast Regional Championships (Fashion Institute of Technology, New York City, March 1), Princeton finished 1st both in coed teams and in women's teams! Erica Wu '18 won women's singles, beating Ariel Hsing '17 in the final. Also competing for Princeton were Marisa Chow '17, Shirley Fu '17, Robin Li '17, Tat Loon Chng GS, Justin Do '17, Avinash Nayak '18, and Zach Weingarten '18. Next up are the National Championships, to be held April 10-12 in Eau Claire, Wisconsin. This is the 10th consecutive year that the Princeton team managed to qualify for Nationals. At the NCTTA spring divisional tournament, Princeton again beat all other schools and won the New Jersey division. Playing for Princeton in this event were Tat Loon Chng GS, Justin Do '17, Shirley Fu '17, Ariel Hsing '17, and Robin Li '17. Regionals will take place on Sunday, March 1, in New York City (Fashion Institute of Technology). 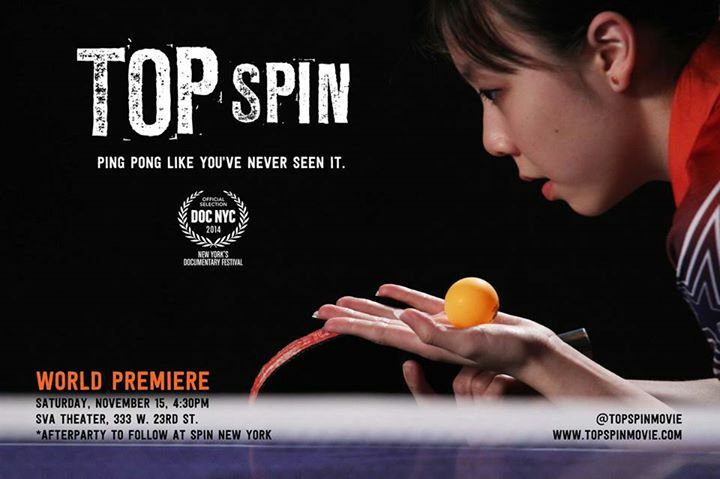 Ariel Hsing '17 and Erica Wu '18 are featured in the new documentary Top Spin which had its world premiere on November 15 at the DOC NYC festival. It has since been screened at several other festivals around the US and Canada. Click here for more info about the film, future screenings as well as distribution online and on DVD. 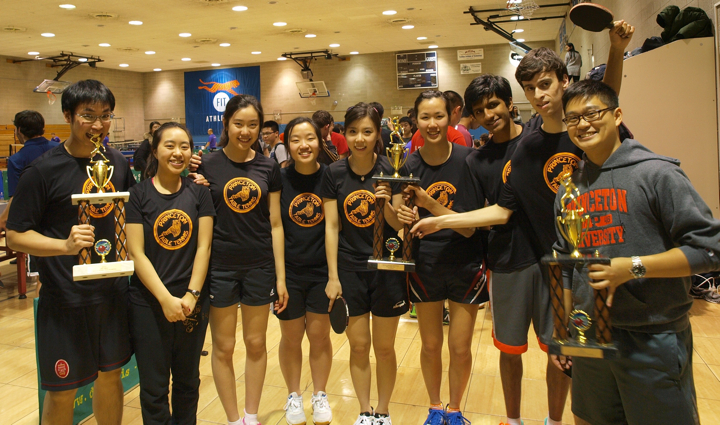 At the 2014 TMS College Table Tennis Championships (April 4-6 in Monroeville, PA), PUTTC won the titles in the women's team and women's singles events! At the NCTTA Northeast Regional Championships (Boston University, March 1), Princeton finished 1st in women's teams and 4th in coed teams. Ariel Hsing '17 won women's singles, beating Shirley Fu '17 in the final. Both Princeton teams and all seven individual players qualified for the National Championships, to be held April 4-6 in Monroeville, PA.
Full Regionals results are posted here. Some video highlights can be seen here. At the 2014 Canada Series Finals - National Team Challenge in Mississauga, ON (Feb 15-16), Shirley Fu '17 took second place in women's singles. In the final round robin, Shirley beat Canadian #2 Anqi Luo and Michelle Liaw (both in straight games) and lost 1-3 to world #150 Zhang Mo. The second NCTTA competition of the season was held on February 9 at the Lily Yip Table Tennis Center in Dunellen. Princeton once again beat all other schools to win the New Jersey division and qualify for Regionals with both the coed and women's teams. 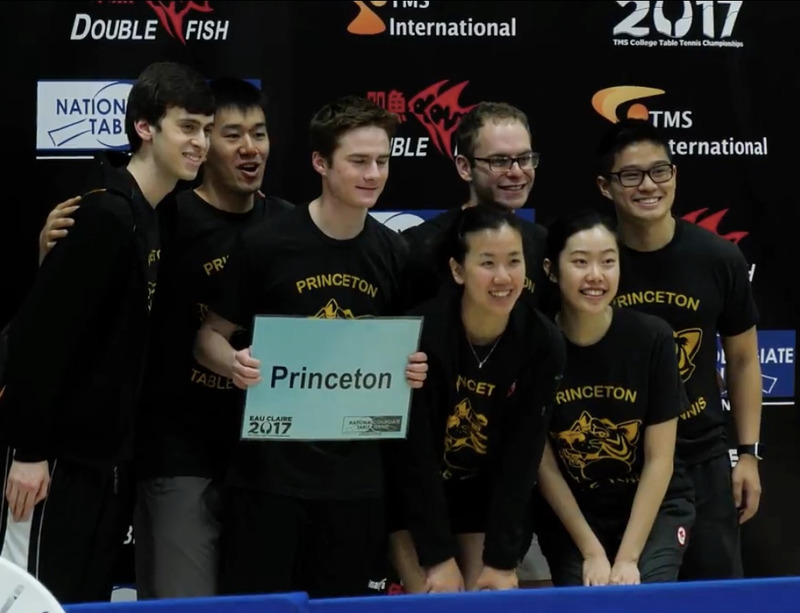 Playing for Princeton this time were Shirley Fu '17, Ariel Hsing '17, Robin Li '17, Kevin Ma '14, Gabe Reder '14, Namkyu Oh '16, Peter Xing '16 and Justin Do '17. Regionals will take place on March 1 at Boston University. - mixed doubles (with Timothy Wang, for the third consecutive time). Click here for full video of the women's singles final (with expert commentary). Adam Hugh '10 reached the final in men's doubles and mixed doubles as well as the quarterfinals in men's singles. At the 2013 ITTF World Junior Table Tennis Championships in Rabat, Morocco (Dec 1-8), Ariel Hsing '17 reached the quarterfinals in the girls' team and girls' doubles events, the round of 16 in girls' singles, and the round of 32 in mixed doubles. The first NCTTA competition of the season (New Jersey division) was held on Nov 24 at the Lily Yip Table Tennis Center in Dunellen. Princeton beat all other schools (Rutgers, NJIT, Rider, Stockton) and finished first both in the coed team and the women's team event. Playing for Princeton were Ariel Hsing '17, Shirley Fu '17, Marisa Chow '17, Robin Li '17, Kevin Ma '14, Gabe Reder '14 and Tat Loon Chng GS. In singles competition, Gabe, Kevin, Ariel and Shirley secured automatic qualifying spots for Regionals. Full results are available here. The second New Jersey divisional meet will take place in February. At the 2013 ITTF Women's World Cup in Kobe, Japan (September 21-23), Ariel Hsing '17 finished in 13th place and won $2500 in prize money. After beating world #166 Li Chunli (New Zealand) 4-1, she lost to world #26 and former European champion Liu Jia (Austria) 2-4. Ariel was the youngest of the 20 players who had qualified for the World Cup. Highlights of Ariel's first match can be seen here (YouTube). The full video of her second match is here. Video of all the matches is available on http://ittf.com/itTV. The event was won by world #1 Liu Shiwen of China. 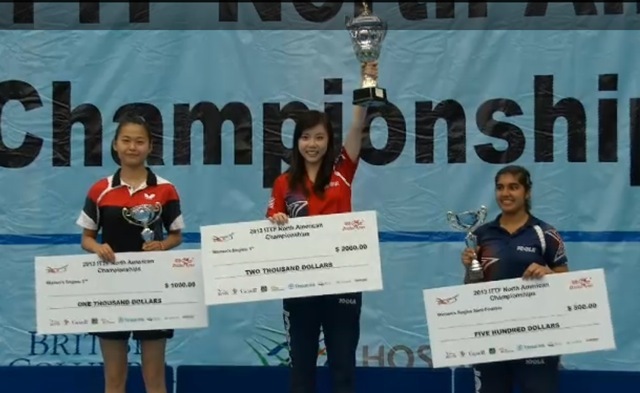 At the 2013 ITTF North American Championships in Vancouver, BC (August 25-27), Ariel Hsing '17 won the title in junior girls' singles, junior girls' team and -- for the first time in her career -- women's singles! In the women's final, Ariel beat the reigning Pan American and Commonwealth Champion Mo Zhang of Canada 4 games to 0. Video of the finals is available here (junior girls' singles starting at 0:18:00, women's singles at 1:09:30). At the 2013 Canadian Championships in Halifax, NS (July 8-14), Shirley Fu '17 won five events: women's doubles; women's team; junior 18 girls' singles, doubles and team. Shirley was also a semifinalist in women's singles and a finalist in youth 21 women's singles. 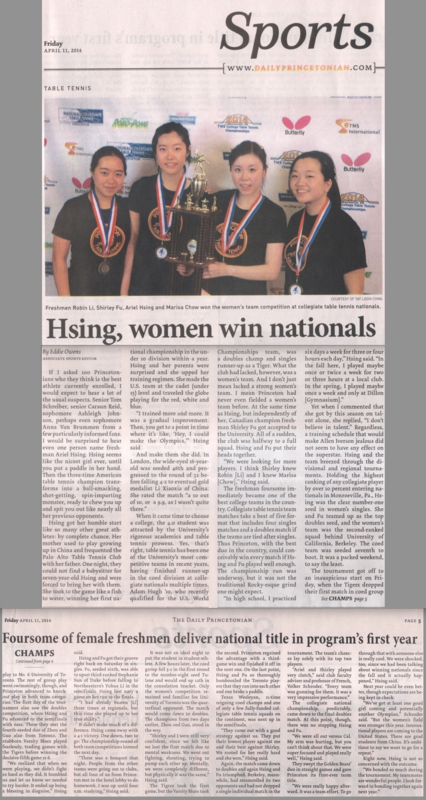 At the 2013 US Open in Las Vegas, NV (July 2-6), Ariel Hsing '17 achieved second place in women's doubles, mixed doubles, and U-21 women's singles (ITTF world tour event). In women's singles, Ariel lost in the round of 16 to the eventual champion Megumi Abe of Japan. Click here to watch highlights of the U-21 final. PUTTC is thrilled to welcome Ariel Hsing (San Jose, California) as a member of the Class of 2017. Ariel is the 2010 and 2011 US champion in women's singles and a 2012 Olympian. She is currently ranked #7 in the world in U-18 (girls 18 and under). PUTTC is delighted to welcome Shirley Fu (Burnaby, British Columbia) as a member of the Class of 2017. Shirley is the 2011 and 2012 Canadian champion in women's singles and a member of the Canadian national team. She will represent Princeton in NCTTA competition. As of September 1st, 2008, "speed gluing" is no longer allowed. Only VOC-free, water-based glue may be used to affix the rubber to the blade. "Boosters" and "tuners" have also been banned. PUTTC regrets to inform all of our community members that effective September 11, 2006, Dillon Gym will no longer allow USATT members to enter the building at no charge. All community members will hence either have to purchase a yearly facility pass or pay a $10 guest fee at the front desk in order to use the gym facilities. Please refer to the Campus Recreation webpage for more information. Click here for our archive of club news from previous seasons. Copyright ©1999-2017 Princeton University Table Tennis Club. All rights reserved. Website is tested to work with IE 5.01SP2 and above, Opera 8.02 and above, and Firefox.